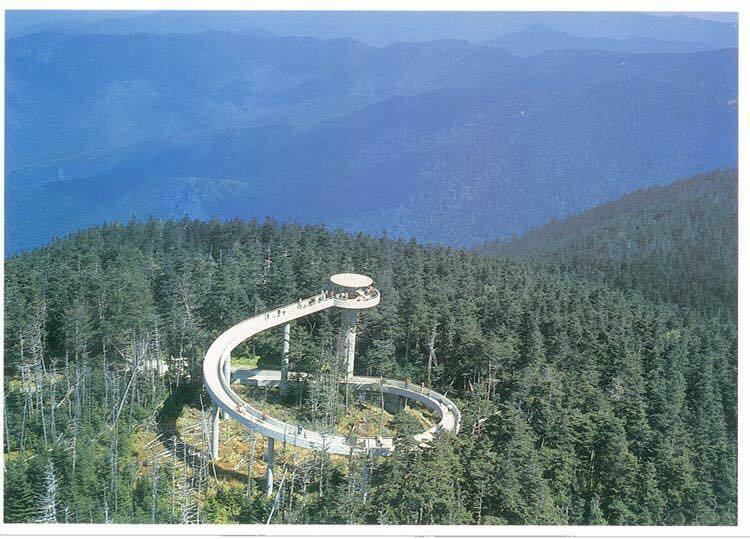 Clingmans Dome is a spectacular attraction in the Smoky Mountains. This 6,643 foot mountain towers over the landscape and commands views that you simply can’t experience anywhere else in the park. Depending on the weather, you may be able to see as many as seven states. If you’re short on time, there’s plenty to see during the drive up and from the parking lot. Temperatures can be up to 20 degrees cooler at the top of Clingmans Dome and the weather may be very different from what you experienced at the park’s entrances. Check the forecast before going, and look on the National Park’s website for any road or trail closures. You can find out more about current conditions at the Sugarlands Visitor Center, south of Gatlinburg. There are more than 380 miles of roads running through the Smokies, making this an ideal destination to visit by car. Many roads are paved, and the gravel roads are well maintained. You can reach the peak from either the North or South park entrances. If you want to stretch your legs during the car ride, there are many pull-offs and historical sights on the way to the Dome. Highway 441, also known as Newfound Gap Road, rises nearly 3000 feet. Along that journey, visitors can enjoy a trip through a wide variety of forests that include hardwood, pine, oak, and spruce-fir. It has been compared to a trip from Georgia to Maine in terms of the different environments you’ll see as you go along. Keep your eyes open for can’t-miss sights including the famous Newfound Gap Overlook. After following the winding road to the top, you’ll find yourself at the parking lot with awe-inspiring views of the nearby mountains. Weather permitting, you may be be treated to up to 100 miles of vistas of the nearby mountains and cities. In fact, on a clear day you can catch sight of seven states: Tennessee, North Carolina, Kentucky, South Carolina, Virginia, Alabama, and Mississippi. Clingmans Dome is truly worth a look if you’re driving through, but keep in mind that the approach road is closed in winter from December through March. However, the observation tower stays open to hikers. If you want a bit of a challenge, take the well-marked footpath to the observation tower. Keep in mind that, although paved, the half-mile trail is very steep. It may be challenging for some people and is not technically considered wheelchair accessible. If the parking lot is full or the crowds are too heavy, there’s plenty you can do after enjoying the views at the top. Consider a moderate-difficulty hike to Andrew’s Bald. This high-altitude meadow offers a different view of the mountain scenery. It’s a great place for a lunchtime picnic. Meanwhile, if you’d like to taste the Smokies without the long drive up Clingmans Dome, check out the Spruce-Fir Trail. This hidden gem, not included on the park’s tourist map, is a great easy walk of just a 1/3 mile. The route, accessible through a small pull-out at mile marker 2.7, is a mostly flat self-guided nature trail where you can see the forests this park is famous for even if you’re short on time. Here you can see boreal fir forests similar to those found in Maine and Canada, making it one of the most unique environments in the Smokies.